Lions found in and around Kruger National Park in South Africa are Panthera leo krugeri. The only documented cases of the white color morph belong to this subspecies. Specifically, the white lions are seen in the Timbavati Game Reserve. In fact, “Timbavati” loosely translated means “place where star lions came down from Heaven”. White lions are NOT albinos! Albino animals have no genetic information that produces color. The result is an animal with very pale blue, red or pink eyes, very pink skin and white fur (if it is a mammal). Instead, white lions are the result of an exceedingly rare, recessive gene. This genetic rarity is known as leucism (loo-kiz-im). Leucistic mammals have normal colored eyes, skin, etc. but the fur is much lighter than normal – or ‘white’. Not all white lions are snowballs! As the lion gets older the snowball white of ‘cub-hood’ changes to a blonde, with adults being more of a lovely alabaster white. 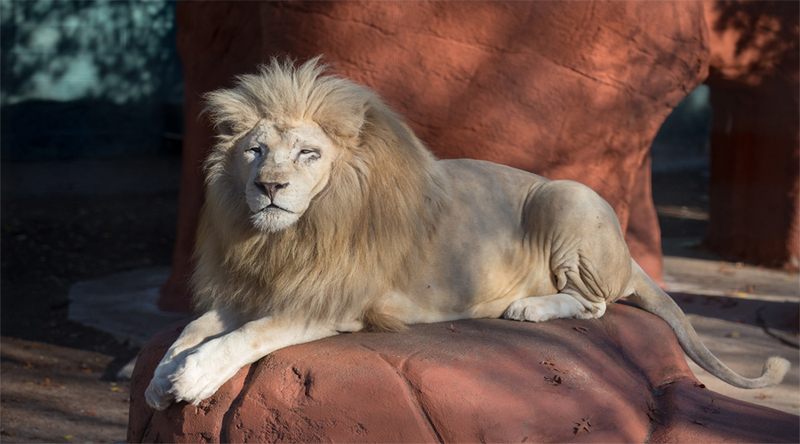 Capron Park Zoo’s White Lion is named “Ramses”, which means “sun-born”.